Select-A-Shield RF EMI Shielded tents are used for everything from pre-compliance testing to secure communications. To assure shielding effectiveness during entry and exit, Select Fabricators, Inc. has developed a vestibule for its Select-A-Shield walk-in enclosures. With most walk-in enclosures, opening the door can immediately degrade shielding effectiveness resulting in possible data capture compromise or data corruption. 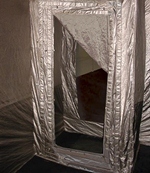 With the addition of the Select-A-Shield vestibule, which is integral to the enclosure, the shielding environment is kept intact for consistent shielding performance. In a typical 9’ wide, x 12’ length Select-A-Shield tent, the vestibule is situated in the right-hand front corner. 3’ x 4’, in size, the vestibule provides entry for personnel via a separate single door double magnet (patent pending) closure system which opens out. The vestibule has its own separate conductive floor, door,and inner walls apart from the tent itself which allows maximum isolation for continuous testing or examination. The door opening to the main compartment opens inwards, making entry and exit easier. Select-A-Shield RF / EMI enclosures are constructed with RoHS compliant, durable, lightweight, Silver/Copper/Nickel, Nova Select fabric, SELECT’s proprietary highly conductive material. Shielding effectiveness for a vestibule measures -73 dB with both doors closed at 916 Mhz. A double wall RF EMI shielding tent with ESD liner yields an average SE of -78 dB average from 150 kHz to 18 GHz without the vestibule. Select-A-Shield RF EMI products are ideal for numerous applications including wireless device development and testing, secure communications, satellite communications testing and isolation, EMC pre-compliance, medical and aerospace equipment shielding, cellular and computer forensics, and RFID shielding for commercial and industrial settings. Because Select-A-Shield products can be customized to almost any size and option configuration, application suitability is endless.